Built at 450 meters altitude Dyo Choria magnetize you. They used to be two separate villages with the river separating them, but today are a single with green all around. In Dyo Choria there are 5 xinara, springs, who have taken their names from the Nymphs. At the village entrance is a spring with a large plane tree offering its shade. 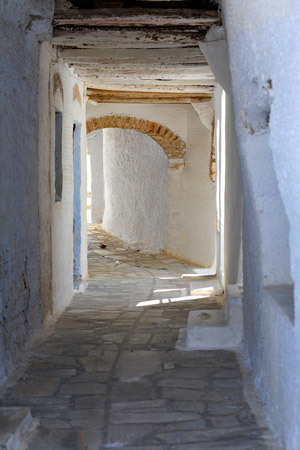 Ascend the stairs to the square with the plane trees and the other xinari with the locals supporting that is the largest square in the Cyclades. Explore the small streets with the arcades and arches. Another strong point of the village? 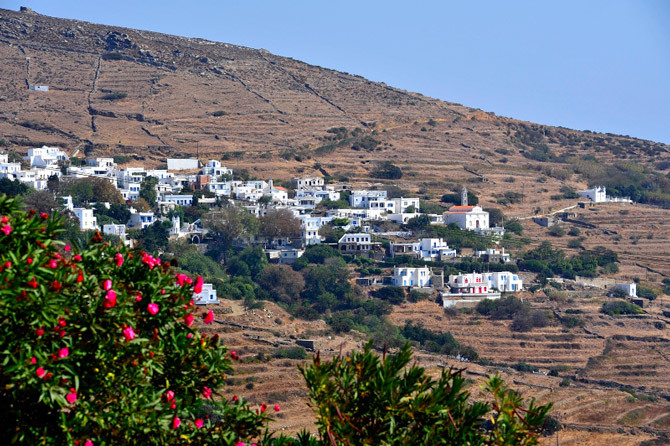 The view to Chora of Tinos, the surrounding villages and the Aegean Sea (from the highest part of the village, if the atmosphere is clear, one can see as far as the island of Naxos). On both ends of the village stand out the two churches, the Church of Agios Ioannis Theologos and the church of Kimiseos Theotokou. Dyo Horia has choices of accommodation, and a restaurant with local ingredients and recipes.